As of Friday, July 21, I completed my first legal action. Granted, it was acting as a Petitioner In Pro Se (on my own behalf) which anyone could do, but the thing is, I did it, and actually understood what I was doing! It was for the adoption of our 17-month-month old daughter, which my partner gave birth to, and which we planned, conceived, and have raised together. 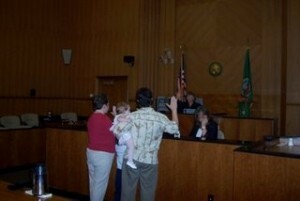 Although we’d planned on going through the adoption process shortly after her birth, mixed answers at the County Courthouse for how to handle second-parent adoptions, and then law school, delayed plans for doing it ourselves. We’d hired an attorney for our son’s adoption, but this time around we were hoping to save high attorney fees. Now that I’ve completed one year of law school, I at least got what a Petition was, along with the other documents that had to be filed, and understood the language when I spoke to someone at the courthouse. So, by doing the adoption myself, law school saved us about $1500, so far. Only another $32,500 and the year will have paid for itself! *grin* Does this count as a legal internship?